POCKET COLORIMETER™ II Applications • Drinking Water • Wastewater • Power • Industrial Water • Field Use • Beverage • Food QC Lab Small in size, big on precision and easy operation. 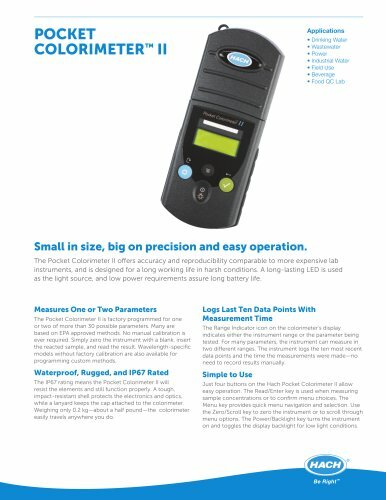 The Pocket Colorimeter II offers accuracy and reproducibility comparable to more expensive lab instruments, and is designed for a long working life in harsh conditions. A long-lasting LED is used as the light source, and low power requirements assure long battery life. Measures One or Two Parameters The Pocket Colorimeter II is factory programmed for one or two of more than 30 possible parameters. Many are based on EPA approved methods. No manual calibration is ever required. Simply zero the instrument with a blank, insert the reacted sample, and read the result. Wavelength-specic models without factory calibration are also available for programming custom methods. Waterproof, Rugged, and IP67 Rated The IP67 rating means the Pocket Colorimeter II will resist the elements and still function properly. A tough, impact-resistant shell protects the electronics and optics, while a lanyard keeps the cap attached to the colorimeter. Weighing only 0.2 kg—about a half pound—the colorimeter easily travels anywhere you do. Logs Last Ten Data Points With Measurement Time The Range Indicator icon on the colorimeter’s display indicates either the instrument range or the parameter being tested. For many parameters, the instrument can measure in two different ranges. The instrument logs the ten most recent data points and the time the measurements were made—no need to record results manually. Simple to Use Just four buttons on the Hach Pocket Colorimeter II allow easy operation. The Read/Enter key is used when measuring sample concentrations or to conrm menu choices. The Menu key provides quick menu navigation and selection. Use the Zero/Scroll key to zero the instrument or to scroll through menu options. The Power/Backlight key turns the instrument on and toggles the display backlight for low light conditions.